In the spring semester, the School of Auxiliary Medicine admitted its first women students, Mary Alice Bennett, M.D., of Wrentham, Massachusetts, and Anna H. Johnson, of Orange, New Jersey. At the Commencement held on 15 June, the University granted the degree of Doctor of Philosophy to Mary Alice Bennett, M.D. for her successful completion of the post-graduate course in medical science offered by the School of Auxiliary Medicine. Dr. Bennett, an 1876 graduate of the Women’s Medical College of Pennsylvania, thereby became the first woman to earn a degree at the University of Pennsylvania. She was among the last students, however, to take the Ph.D. from the School of Auxiliary Medicine. The School’s two-year course was far less demanding than the modern Ph.D. and beginning in 1882, the Trustees substituted the degree of Bachelor of Sciences Auxiliary to Medicine for the Ph.D. In that same year, Martha Paul Hughes, M.D., an 1880 graduate of the School of Medicine at the University of Michigan, was a member of the first class to earn the B.S. Auxiliary to Medicine degree at Penn. In 1898 the School of Auxiliary Medicine was closed. 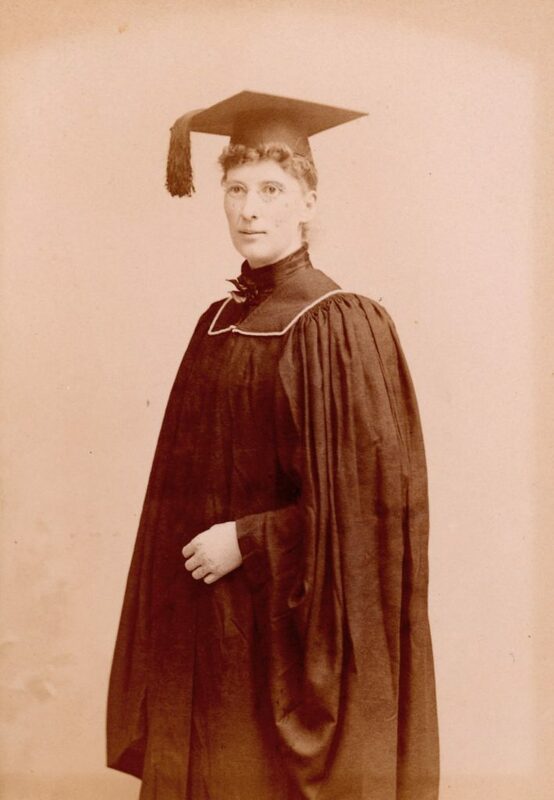 Also at the Commencement of 1880, the University granted a Certificate of Proficiency in Science to Mary Thorn Lewis. The Law School admitted its first woman student, Caroline Burnham Kilgore, M.D., of Philadelphia. The Wharton School was founded, but did not admit women. The Graduate School of Arts and Sciences was founded and was the first to admit women at its establishment to courses leading to a degree. In October, the faculty of the College recommended the admission to the College of Ms. Ida C. Craddock. The faculty noted that she had applied for admission to the first-year year class of the College and had passed the required examination. Frederick Fraley, chairman of the committee of the Trustees charged with oversight of the College, presented a ten-part plan for establishing a “women’s section” in the College. His proposal was rejected and Ms. Craddock denied admission. Rt. Rev. William Bacon Stevens, Bishop of the Episcopal Diocese of Pennsylvania and also one of the Trustees of the University, then introduced a resolution explicitly prohibiting the admission of women to the College. The Trustees adopted the Bishop’s resolution, but also adopted a resolution offered by another Trustee, George Whitney, “that the Trustees will organize a separate Collegiate Department for the complete education of women, so soon as funds are received sufficient to meet the expense thereof.” The Trustees thereby committed themselves to establishing a college for women at Penn, but more than fifty years passed before the College for Women matriculated its first students. At the Commencement held on 15 June, the University granted the degree of Bachelor of Laws to Caroline Burnham Kilgore. She became the first woman admitted to the practice of law before the Supreme Court of Pennsylvania. Eighty-two years after her graduation, during the University’s Homecoming Weekend of October 1965, the Trustees dedicated Kilgore House, one of the four houses in the Robert C. Hill Residence Hall, in her honor. Also at the Commencement of 1883, the University granted Certificates of Proficiency in Music to four women: Helen Archibald Clarke, Marie Elisabeth Jefferys, Katherine E. Smaltz, and Annie V. Spooner. They were the first students to complete the two-year course leading to the Certificate of Proficiency. Helen Clarke was the daughter of the Professor of Music, Hugh Archibald Clarke. She became a distinguished author and poet and lived in Boston, Massachusetts. Marie Jefferys also became a well-known author. She married Henry Lee Hobart and lived in New York City. Katherine Smaltz was active in the Philomusician and Matinee Musical Clubs of Philadelphia. She married Charles Mortimooe and lived in West Philadelphia. The School of Veterinary Medicine was founded, but did not admit women. The Department of Biology was founded and was the third academic program at Penn to admit women from its inception, though its course did not lead to a degree. Its purpose was “to provide a course of instruction in Biology for students of both sexes who are preparing to study medicine, or who desire systematic training in this subject.” A Certificate of Proficiency was granted to those who successfully completed the two-year course. The Board of Managers of the Hospital of the University of Pennsylvania voted to establish a training school for nurses. In May 1886, the Board appointed Charlotte Marie Hugo, a native of Devonshire, England, the first Superintendent of Nurses and Directress of Nurses in the Training School. She was the first woman to serve as an officer of instruction at the University of Pennsylvania and the first woman to serve as an academic administrator at Penn. Prior to accepting her appointment at Penn, Ms. Hugo had trained at the Nightingale School connected with St. Thomas’ Hospital in London. The Board of Managers of the Hospital simultaneously elected her Superintendent of the Hospital. She was the first woman to serve as Superintendent of the Hospital and the first woman to serve as chief administrative officer in any school, resource center, or affiliate of the University. All responsibilities of all three positions were perhaps too much to ask of just one person, for Ms. Hugo submitted her resignation after just one and one-half years and left the University. At the Commencement held on 15 June, the University awarded the Certificate of Proficiency in Biology to Ida Augusta Keller. She was the first woman to complete the two-year course in Biology. Four years later she earned the Ph.D. degree from the University of Zurich in Switzerland. In December, the University Hospital Training School for Nurses was founded and was the fourth academic program at Penn to admit women from its inception, though its course did not lead to a degree. The Board of Managers of the Hospital also opened the Wood Memorial Nurses Home, on the southwest corner of Thirty-fourth and Spruce Streets. It was the first residence hall for women at Penn. In June, the University Hospital Training School awarded its first diploma in nursing to Mary J. Burns. She was the first person to complete the course in nurses’ training. One year later there were nine members of the graduating class, all women, one of whom, Elizabeth Weston, was a Native American. The Department of Biology appointed Emily Lovira Gregory, A.B., Ph.D., to the faculty position of teaching fellow. She thereby became the first woman member of the faculty at Penn. Born in Portage, New York, Emily Lovira Gregory taught school until, at the age of thirty-five, she entered Cornell University, where she earned the degree of bachelor of arts in 1881. She then travelled to Europe, where she earned a doctorate in botany at the University of Zurich. After her year at Penn, she was appointed lecturer at Barnard College in New York City. At Barnard she played an active part in championing the cause of graduate students and encouraging laboratory assistants by paying them out of her own funds. She died at the age of fifty-six, two years after becoming the first woman to win promotion to a full professorship at Barnard. In June, the Trustees authorized the election of women to the Board of Managers of the Hospital of the University of Pennsylvania and elected three women Managers, Ellen Nixon Waln Harrison (“Mrs. Charles C. Harrison”), Sarah Van Syckel Heberton (“Mrs. G. Craig Heberton”), and Sarah Wharton Barker (“Mrs. Abraham Barker”). They were the first women to serve the University as directors or managers of a school or center. In October, the Senior Class in the College organized a protest against co-education and presented a petition to the Trustees signed by virtually all the members of the class. In November, however, the Trustees accepted the offer of Joseph M. Bennett to endow a college for women. In January, the Trustees announced that they had met with “a number of the foremost women educators of Pennsylvania” and formulated a proposal for a Graduate Department of Women. The proposal was formally adopted and referred to the Committee on [the Graduate School of Arts and Sciences] and the Committee on Ways and Means for implementation. In March, six women students established at Penn the Beta Alpha chapter of the national Kappa Kappa Gamma sorority. It was the first sorority at Penn. The founders were Josephine Feger Ancona (Cert. of Prof. in Biol., 1891; B.S. in Biol., 1895), Rose Ancona (Cert. of Prof. in Biol., 1891), Martha Bunting (Cert. of Prof. in Biol., 1890), Kathleen Carter (Cert. of Prof. in Biol., 1890; Ph.D. in Psychology, 1896; after her marriage, “Mrs. John Percy Moore”), Jessie Lippincott Colson (Cert. of Prof. in Biol., 1889), and Lois Meiss Otis (student in the Graduate School of Arts and Sciences, 1889-90 and 1890-91, but did not earn a degree). Martha Bunting was the first President. Kappa Kappa Gamma occupied 3323 Walnut Street from 1921 to 1959, when the house was demolished to make way for Hill House. Kappa Kappa Gamma occupied 225 South 39th Street from 1959 to 1970. This was followed by rented space in two fraternity houses, Delta Psi and Delta Phi, before the Beta Alpha chapter was disbanded in 1975. In April, the Trustees adopted a resolution which created a Board of Managers for the Graduate Department of Women, to be composed of seven Trustees and five women. The Trustees elected Agnes Irwin, Mary McMurtrie, and Ida Wood to the Board of Managers. In June, the Provost nominated Mary H. Rodgers Biddle (“Mrs. George Biddle”), Frances E. Bennett, Mary Burnham, and Anna Wright Baird (“Mrs. Matthew Baird”) to the Board of Managers of the Graduate Department of Women. The Trustees “confirmed” the nominations, but Biddle and Burnham may not have agreed to accept their respective nominations as their names did not appear among the Managers of 1891. At the Commencement held on 5 June, the University granted the Certificate of Proficiency in Music to Ida Elizabeth Bowser. She was the first African American woman to enroll in classes at Penn. The University opened the second women’s residence hall – this one for women in the Graduate School only – in two houses at the southeast corner of Thirty-Fourth and Walnut Streets. These properties had been donated to Penn by Joseph M. Bennett as part of his endowment of a College for Women. In December, the Trustees formally established the Graduate Department for Women by adopting a resolution assigning the entire faculty of the Graduate School of Arts and Sciences to secondary appointments in the Graduate Department for Women. The Trustees published an announcement stating that the Graduate Department for Women was founded “for the purpose of affording to women the opportunities for advanced study which are provided by the Faculty of [the Graduate School of Arts and Sciences]. It is under the direct control of a Board of Managers appointed by the Trustees, and has accommodations for residence and study in a Hall presented by Joseph M. Bennett, of Philadelphia, nearly opposite to the Library and convenient to the class-rooms and laboratories of the several departments in which its students receive their instruction.” Anna Wright Baird (“Mrs. Matthew Baird”), Frances E. Bennett, Mary Pepper Norris Cochran (“Mrs. Travis Cochran”), Deborah Brown Coleman (“Mrs. George Dawson Coleman”), Agnes Irwin (Hon. Litt.D., 1898), Mary McMurtrie, and Ida Wood were members of the first Board of Managers and formed a voting majority of the Board. In November, the Trustees elected Ida Wood the first Secretary of the Graduate Department for Women, but “without salary.” She resigned her position in February 1893, less than a year and a half later. In May, the Trustees enlarged the Board of Managers of the Graduate Department for Women to twenty and elected Alice Potter Lippincott (“Mrs. J. Dundas Lippincott”), Anna S. Biddle Blair (“Mrs. Andrew A. Blair”), and Eleanor Elkins Widener (“Mrs. George D. Widener”) to the Board. Also in May, the University held a formal “Opening of the Graduate Department for Women.” M. Carey Thomas, President of Bryn Mawr College, was the principal speaker and she described in detail the advancement of women in higher education in the United States. She noted that 165 colleges in the American West were “conferring on women regular degrees in arts and sciences;” that co-education became the norm in the West after 1870, when the University of Michigan opened its admissions to women; and that the “two new Western universities, that promise to be the most richly endowed in all America, the Leland Stanford University in California, and the University of Chicago, make no distinction between men and women.” She noted also that in the American South there were “thirty-nine co-educational colleges and universities,” including the State universities of Kentucky, Mississippi, and Texas. She noted also that in New England and the Mid-Atlantic, “within the last few months the great University of Yale has admitted [women] to all its graduate instruction, its second degrees, and its fellowships; … Brown, has this year admitted women to its examinations, and, as I have heard from the president, in a letter received last week, will next year admit women to all its graduate work; … Boston University and the Massachusetts Institute of Technology are open to women … Cornell is open to women; the degrees of Columbia, and to all intents and purposes its graduate department, are open to women; … [and] in the East, where there is a choice, we find in the four best known colleges for women, in Vassar, Wellesley, Smith, and Bryn Mawr, no less than two thousand women.” The program was concluded by Provost William Pepper, who announced that a total of eight graduate fellowships were fully endowed in the Graduate Department for Women and would be offered to prospective students in the 1892-93 academic year. The Trustees established five undergraduate professional degree programs in the School of Engineering: Bachelor of Science in Architecture, Bachelor of Science in Chemistry, Bachelor of Science in Civil Engineering, Bachelor of Science in Electrical Engineering, and Bachelor of Science in Mechanical Engineering. Women were not admitted to these courses. At the Commencement held on 15 June, the University granted the degree of Doctor of Philosophy in English to Anna Robertson Brown. She was the first woman to earn the modern Ph.D. at Penn and the first person to earn Penn’s Ph.D. in English. After taking her doctorate, she married Samuel McCune Lindsay, Professor of Sociology at Penn, and she began a career of authoring religious works, publishing more than a dozen monographs over a thirty-year period. She also served as a Trustee of her college, Wellesley, from 1906 to 1918. In February, the Nurses Alumnae Association of the Training School for Nurses was founded. Its purpose was “to advance the best interests of the nurses, to promote good fellowship among graduates, and to establish a fund for their benefit in times of sickness and death.” The first officers were: Jane A. Delano (Assistant Superintendent and Instructor in the Nurses’ Training School), President; Laura Hamer (Class of 1892) and Rose L. Newton (Class of 1889; after her marriage, “Mrs. James B. Sturdevant”), Vice Presidents; Anna J. Weaver (Class of 1891), Secretary; and Catherine E. Damm (Class of 1893; after her marriage, “Mrs. J. H. Kingsbury”), Treasurer. The University Hospital Training School for Nurses extended its course from two years to three. The three-year course remained the standard until the School was closed in 1978. At the Commencement held on 16 June, the University granted the degree of Master of Arts to Alice Minerva Atkinson and Eleanor Elizabeth Tibbetts. They were the first women to earn the modern M.A. at Penn. Both continued their graduate studies at Penn. In 1894 Tibbetts became the first woman to earn Penn’s Ph.D. in Philosophy and in 1895 Atkinson became the first woman to earn Penn’s Ph.D. in Latin. In February, the Trustees elected seven women–Anna Wright Baird (“Mrs. Matthew Baird”), Mrs. Rudolph Ellis, Mrs. E.A.P. de Guerrero, Emily Gardiner Leland Harrison (“Mrs. John Harrison”), Alice Potter Lippincott (“Mrs. J. Dundas Lippincott”), Sara Yorke Stevenson (“Mrs. Cornelius Stevenson”), and Sabine d’Invilliers Weightman (“Mrs. William Weightman, Jr.”)–to the Board of Managers of the University Museum. These seven were the first women to serve the University as overseers of the University Museum. At the Commencement held on 5 June, Sara Yorke Stevenson became the first woman recipient of an honorary degree. The Trustees granted her the honorary degree of Doctor of Science in recognition of her founding role in the University Museum. She was the first woman to be awarded the Sc.D. degree at Penn. In July the Trustees established a four-year course, leading to the degree of Bachelor of Science in Biology and open to men and women “on equal terms.” This was the first, modern, full-time, four-year, undergraduate course open to women. In September Fuji Tsukamoto enrolled in the Graduate School of Arts and Sciences and declared Botany, Zoology, and Chemistry her fields of study. A graduate of Wilson College in Chambersburg, Pennsylvania, Fuji Tsukamoto was the first Asian American woman to matriculate at Penn. In October the Courses for Teachers program was founded under the direction of Professor Martin G. Brumbaugh and became the sixth academic program at Penn to admit women from its inception. Described by the Trustees as “the work in Pedagogy at the University,” its purpose was to “meet the needs of teachers who wish to pursue work in one or more subjects.” It may properly be seen as the predecessor to the School of Education. In order to accommodate teachers already actively employed, the classes were held on Friday evenings and Saturday mornings only. A Certificate of Proficiency was granted to those who successfully completed the course. Also in October, the Provost reported to the Trustees that the Board of Managers of the Graduate Department for Women had been reduced in number by four: Deborah Brown Coleman (“Mrs. George Dawson Coleman”) and Alice Potter Lippincott (“Mrs. J. Dundas Lippincott”) had died and Agnes Irwin and Ida Wood had moved away from Philadelphia and resigned from the Board. The Provost nominated “Mrs. John Markoe,” in Agnes Irwin’s place and the Trustees “duly confirmed” the nomination. In December the Trustees established a four-year course at the Wharton School leading to the degree of Bachelor of Science in Economics. Women were not admitted to this course. At the Commencement held on 11 June, the University granted the degree of Bachelor of Science in Biology to Josephine Feger Ancona (Cert. of Prof. in Biol., 1891). She was the first woman to complete the four-year course in Biology and the first woman to earn the undergraduate bachelor’s degree at Penn. Martha Paul Hughes Cannon, M.D., who in 1882 had earned Penn’s degree of Bachelor of Sciences Auxiliary to Medicine, was elected to the first of two terms in the Utah State Senate. Dr. Cannon was a native of Wales, whose family had settled in Salt Lake City in 1862, in what was then the U.S. territory of Utah. After earning the M.D. degree at the University of Michigan in 1880 and the B.S. Auxiliary to Medicine degree at Penn, she returned to Utah, practiced medicine, and married Angus M. Cannon. In 1896 she was elected to Utah’s first state legislature and was re-elected four years later. She was the first woman in the United States to be elected a State Senator. In October, the Trustees elected Dr. Fanny Rysam Mulford Hitchcock to the Board of Managers of the Graduate Department for Women. She succeeded “Mrs. John Markoe,” who had resigned from the Board. Dr. Hitchcock had first enrolled at Penn in the fall of 1890 as an undergraduate student in Biology. When she returned in the fall of 1891, however, she matriculated as a student in Graduate School of Arts and Sciences. After three years of graduate studies, she earned Penn’s Doctor of Philosophy degree in Chemistry in 1894, the first woman to take in the Ph.D. in Chemistry. In December, the Trustees re-organized the Graduate Department of Women to provide for a Board of Managers of twenty-four members, to be elected by the Trustees in April of each year for one-year terms; an Executive Committee of five members, to be appointed by the Provost in May of each year for one-year terms; a “Director [who] shall always be a woman,” to be elected by the Trustees in April of each year for a one-year term beginning 1 September of that same year. The Board of Managers was granted control of the administration of “Bennett House,” at 3448-50 Walnut Street, with authority over its finances, including its trust funds. The Director was responsible for the student life of all women students. She was also an ex-officio member of the Board of Managers and Chairman of the Executive Committee. Fanny Rysam Mulford Hitchcock (Ph.D., 1894) was the first Director of Women Students and had an office in Room 102 of College Hall. In May, Joseph Bennett gave to the University “four houses adjoining Bennett Hall, to be used for the higher education of women.” Bennett Hall, his original gift in 1890, consisted of two four-story houses at 3448 and 3450 Walnut Street. This additional gift consisted of 3440, 3442, 3444, and 3446 Walnut Street. Together they included all the ground now covered by the present-day Bennett Hall. At the Commencement held on 8 June, Agnes Irwin became the second woman recipient of an honorary degree at Penn and the first to be celebrated for advancing the cause of women in higher education. The Trustees granted her the honorary degree of Doctor of Letters (Hon. Litt.D.) in recognition of her accomplishments as the founder of a distinguished college preparatory school for women in Philadelphia and since 1894, Dean of Radcliffe College in Cambridge, Massachusetts. She was the first woman to be awarded the honorary Litt.D. degree at Penn. In May, the Trustees re-organized the Graduate Department for Women and elected Frances E. Bennett, Bertha Dechert, Gertrude Stevenson McMaster (“Mrs. John B. McMaster”), Mary McMurtrie, and “Mrs. Felix E. Schelling” to the Board of Managers of the Department. Also in May, the Trustees authorized the expenditure of $1,000 for the repair and maintenance of Bennett Hall at 3448-50 Walnut Street. Also in May, the Trustees accepted the offer of Frances Hitchcock, one of the Managers of the Graduate Department for Women, to provide part of the building at 3903 Locust Street to the University as a “temporary gymnasium for women,” at no charge to the University. In September, the Trustees appointed Elizabeth A. Ryder, M.D., to the faculty position of Assistant Director of the Department of Physical Education. She held that position for two academic years before submitting her resignation to the Trustees on 29 May 1901. In December, “at the suggestion of the women students of the University,” the Trustees authorized the use of the gymnasium for women, located “at 39th and Locust Streets.” The Trustees confirmed their earlier appointment of Elizabeth A. Ryder, M.D. to the faculty position of Assistant Director of the Department of Physical Education. They also appointed Esther Kuhn to the part-time faculty position of Instructor in the Department of Physical Education. They set the annual salary of Ms. Kuhn at $300 with the understanding that if her work should expand to full time, her compensation would increase appropriately. In order to defray the cost of Ms. Kuhn’s salary, they established a gymnasium general fee of $1 per semester and charged it to all women students in the Biological Department and the course in Interior Decoration. Women students at Penn published an announcement of the organization of a Women’s Club. The Club was located at 3903 Locust Street, in the same building as the women’s gymnasium. The purpose of the club was “to promote social interests among the women students and especially to provide as far as possible for the undergraduates an opportunity for college life.” The founders and first officers of the Women’s Club were Frances Anne Keay (LL.B., 1902), Jessie Kellogg Henry (Department of Biology, but did not graduate), Helen Taylor Higgins (B.S. in Biology, 1900), and Marianne Roxana Seward Young (Courses for Teachers, no degree offered). It does not appear, however, that this first Women’s Club prospered, because nothing more was heard about it. The financial support of Dr. Fanny Rysam Mulford Hitchcock was essential in opening the women’s gymnasium at 3903 Locust Street and it therefore seems likely that the fortunes of the Women’s Club at the same address were tied to the continuing interest of Dr. Hitchcock in the women of the University. When she declined, in May 1901, to continue as “Director of Women Students” at Penn, the Women’s Club and women’s gymnasium at 3903 Locust Street were probably closed soon thereafter.